Like most homeowners, I own several houseplants. I have propagated and re-rooted them and what was once 2 or 3 is now 10. Several of the larger houseplants we stuck in the sunroom. I tend to forget about those and only water them on rare occasions. Yet, they seem to be thriving. They love all the sun and warmth. Well, about 2 weeks ago I noticed that one of those ignored houseplants had a bloom stock. I was quite surprised and proud. Of course I took a picture of the moment. I may never see this again in my lifetime. Neither my husband nor I could remember the name. We both thought it was of the Dracaena species. We marveled at the bloom and thought we had done pretty well. Well fast forward to this afternoon. I stepped into the sunroom and thought the blooms looked a bit bigger. As usual, I hadn't paid much attention to the plants. My attention span can only handle so many new things at once. I took a close look at the plant and decided, Yes - the blooms do look bigger. Very cool. This evening we left the house for a few hours (dinner and shopping). When we came home and walked into the door, my nostrils were overpowered by a sweet smell. "What is that smell?" I asked Dave. He remarked it smelled a lot like Honey. I had to agree. We put our noses to the air and ended up in the sunroom. That honey smell had turned into a powerful aromatic perfumed scent - heavenly, yet slightly overpowering. 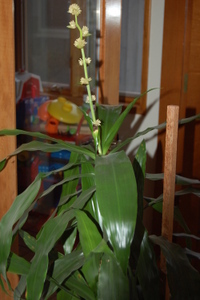 Our little ignored houseplant was now open and filling the air with its fragrance. 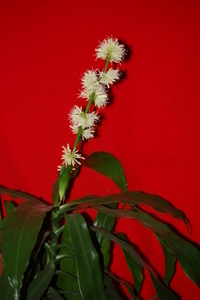 Only very mature plants of 6 feet or more will bloom. 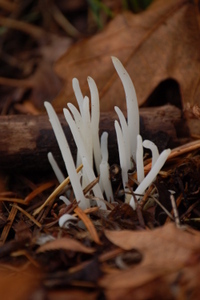 In the evening the plant gives off a sweet fragrance that is noticeable for hundreds of feet. The fragrance is very strong. Well, further research shows this plant is used in outdoor landscaping in Southern Florida. I can see why. We will enjoy it's scent for the next 3-7 days. In the meantime, we may have to open a window or two. Long Hair and a Robe - what did you expect? Dave brought all the Christmas boxes down from the attic this evening and before the boxes even touched flooring, my children had them open and were pulling Santa's, Snowmen, Bells, and Jeweled Fruit. I was trying to contain the flurry of decorations when I heard Jammin' yell in delight. "I remember this stuff." He had found the Nativity Scene and was pulling ceramic Camel and Sheep from their bubble wrap. My heart leaped at the thought of a broken baby Jesus on the floor when I saw Buttercup reach into the same box. "Oh look!" She declared, "I found Jesus." Jammin' took one look at the blonde-haired Virgin* and rolled his eyes, "That's Mary, not Jesus. Jesus is a BOY." Buttercup quickly retorted back with all her 4-year old wisdom and knowledge. "No Jammin', this is JESUS. Jesus is a GIRL." Once again, Jammin' corrected his sister. Buttercup turned to me. "MOM. Jammin' says this is Mary and that Jesus is a BOY, but Jesus is REALLY a GIRL"
I shook my head, "Sorry, Buttercup, but Jammin' is right. Jesus was a boy. You are holding Mary." Some wise person once said A picture is worth a thousand words. Well, I wish I had a picture of Buttercup's face at that moment. Outrage, disgust, horror, disbelief all rolled into one look. Then, she grunted a noise that resembled the same, gently set Mary back down, and stormed from the room. Jammin' looked at me and shrugged. "Jesus kind of sounds like a girl's name." I wonder what Jesus would think of that. 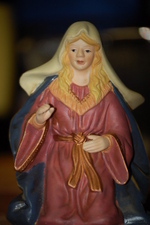 *yes, our e-bay purchased Nativity Set has a very Caucasian Mary. I'm hoping to replace her with a Japanese one. May we please have a moment of silence for Fred..............the fish. He was a humble fish. Never caused a problem and didn't ask for much. He just swam around in his bowl looking pretty for us whenever we needed him. He died sometime over our Thanksgiving Holiday. He was last seen alive when Dave fed him before leaving the house on Wednesday. Jammin' found him dead when we returned Sunday afternoon. Buttercup cried tears of sorrow for our lost friend. Well, maybe it was lack of food for 4 days. Maybe it was because the furnace tripped off while we were gone and the house cooled to a chilly 47°F (8°C). Either way, we'll miss Fred. We hope he's happy in Fishy Heaven. and Happy 58th Anniversary to my In-laws, Al and Max. I hope Dave and I can make it that far - but considering he'll be 91 and I'll be 86, we're not holding our breaths!. You are our role models for a happy marriage! Congratulations and best of health to both of you! There were these pilgrims who wanted to worship the God they wanted to worship, but the king wanted them to worship him, and they didn't want to. So, they got on this ship, the Mayflower, and headed for a land called Plymouth. There they met Squanto and he taught them how to fish and plant corn and pumpkins. There were 22 adults and 30 kids. They shared their food with the Indians and called it Thanksgiving. Robin, one of my first bluddies, has some poetry going on. Here is my contribution. Thanksgiving time comes once a year. and now it is again very near. and let out my pants in the rear. Fun Monday - or a Tale Told that I'd rather not. Karisma asked for a Trip down Memory Lane and asked to hear a story - THAT STORY - the one I can't live down...the story of something I did that keeps getting told and retold and retold again. Sigh - why does it seem like one particular story sticks out? And why does this story get louder and louder with each retelling? Weddings are full of warm rich memories. They represent love and new beginnings. But for me, one wedding in particular represents nothing but shame and embarrassment on my part. A moment in time that I would like to forget for all eternity. An innocent act of a child turned into painful years of nightmares (okay, not really, I'm just being dramatic). The year was 1976 and I stood beside my mother during her wedding ceremony to my step-dad. I was only a wee child of six and wearing my prettiest dress. The tiny ceremony was held in a friend's home among a very small gathering, including my grandmother. The Pastor opened with a prayer and then began the proceedings. "Pamela, would you repeat after me...."
And that is when it happened; an unfortunate bit of methane escaped. No, it wasn't a "silent-but-deadly" version but the opposite: "Loud and Proud". That's right, I farted big time. I reacted the only way a six year old girl child could. I looked to my grandmother for answers. Should I laugh? Should I scream and run and hide? Should I pretend that nothing happened? Was I in trouble? Had I ruined the wedding? What?! What?! What?! My grandmother's answer to the solution was to put her fingers to her lips and in her "softest" voice possible, she shushed me. Not once. Not twice, but FIVE times. Ssssh, Ssssh, Ssssh, Ssssh, Ssssh. Every telling of this story my fart gets louder. Every telling of this story the Ssssh gets louder. I figure by the time I'm 75, my fart will have managed to ignite the candles across the room and blow my Great-aunt Myrtle's corsage off her dress. AND hey - speaking of my great-aunt Myrtle reminds me of another story....but I'll leave that for another post. Sis, I've taken the cue from you, now we have our own little recycling center! Of course, ours is a brown paper bag... but it's the effort that counts right?! Yes, little sister, it's the effort that counts - and yours was the 5,000th. Me - You were my 5,000th commenter! Amanda - You are shittin' me. Me - No, You won! Amanda - What did I win? Me - Um....I don't know yet, but I'll come up with something. Amanda - Cool, I never win anything! So, congratulations Amanda! Your prize will be hand delivered to you! Most likely next Tuesday when we meet up at Grandma's house! Swampwitch is hosting a House Warming for two blogging buds - Julie and Tiggerlane. Both ladies are about to move into brand new homes. They've been blogging the progress and I've enjoyed watching their empty lots transform into beautiful houses. My Recycling Center is located in my garage - just beside the door that leads into the kitchen. 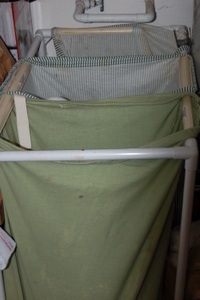 I purchased a unit that normally is sold as a Laundry Bin; usually located in the laundry room for separating whites, colors, and towels. However, I have found it to be great for recycling. Not only is it an easy way to separate the recycling, but the bags are washable! So, when they start to look on the nasty side or a funky smell develops - simply empty the bag and throw it in the wash. Simplistic. The reason my recycling center is located right outside the kitchen door is for even easier recycling. Empty a can of soup? Open the door and toss it in. I don't need shoes, coats, or have to let jars and cans accumulate in my kitchen. Plus, having the unit in the garage keeps my house clutter free. What do I keep separated in my recycling? Here are some pictures. Also, I keep a large box in the garage to store all the cardboard that I accumulate during the week. When the box fills, I recycle the contents. Of course, in this house, the box fills weekly. Fortunately for me, I have curbside recycling. By the Way - I am fast approaching my 5,000 Typepad Comment. It could be YOU - and you could be the winner of a PRIZE!!! So, comment away. THANKS!